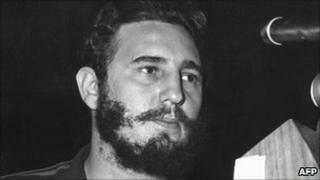 Cuba has condemned the release of a new video game in which United States special forces try to kill a young Fidel Castro. State-run media said the game, Call of Duty: Black Ops, attempted to legitimise murder and assassination in the name of entertainment. The Cubadebate website said it would also turn American children into sociopaths. The BBC correspondent in Havana, Michael Voss, says Cubadebate takes a dig at all the failed real life attempts to kill Cuba's former president. The website says that the US government is trying to achieve through virtual reality what it had not been able to do in real life during Mr Castro's 50 years in power. The Cubans say there were more than 600 attempts on his life, ranging from poison pens to exploding cigars. In the end, it was ill health which forced Mr Castro to relinquish the presidency. Now 84 years old, he is still head of Cuba's Communist Party. Released earlier this week, Call of Duty: Black Ops takes players on secret missions abroad during the height of the Cold War. It lets players shoot their way through the streets of Havana, in a bid to assassinate the then young revolutionary leader. Its predecessor, Call of Duty: Modern Warfare 2, generated more than $1bn (£618m) in sales. Call of Duty: Black Ops is the seventh game in the series and the third to be developed by US-based developer Treyarch. It is not the first controversial military-style video game. Last month, the latest edition of Medal of Honor was banned from US military bases because it let players pretend to be Taliban fighters killing US troops in Afghanistan. Its publisher Electronic Arts eventually renamed the enemy forces the opposition.